Provides collaboration between roles in an organization; Developers can provision a version of an application, make changes, test, and promote those changes for approval. Quality Engineers can automate the creation of Db2 test environments to speed and improve testing activities. 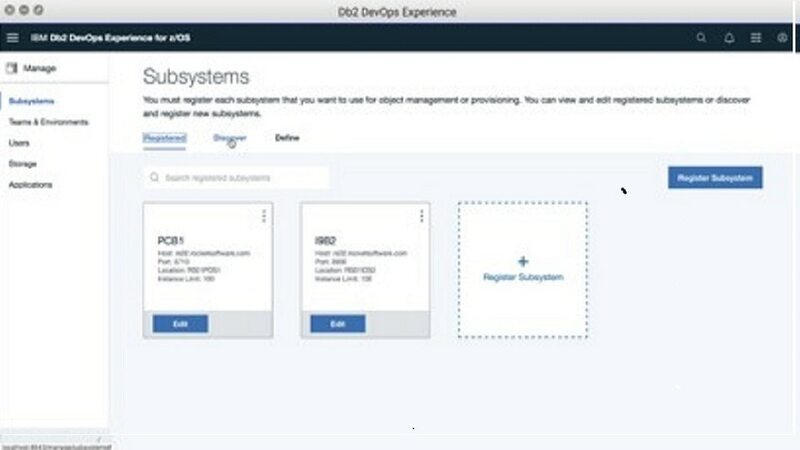 Administrators can set the site rules for Db2 schema standards, review and approval of changes, and usage rules. One of the important functions for the database administrator is the ability to create and link together teams, environments and permissions. Using cognitive capabilities, you can take advantage of the application discovery feature to identify schema application components. You have the ability to visually discover and select objects, combined with search and filtering capabilities to improve the accuracy and efficiency of schema discovery. The rule generation and enforcement mechanism for schema attributes is controlled by the database administrator with site rules. Once the rules have been determined, the rule-based DDL and HTML editor prevents the developer from coding unauthorized changes, saving time and resources. This feature will establish a mechanism through which authorized users will accept or reject changes submitted by end users prior to becoming part of an application definition for a specific level, such as development, test and production. Having a change approval mechanism ensures that only approved changes are propagated to sensitive environments, preventing rogue and uncontrolled changes.